Most of the year, we, like you, keep our proverbial nose to the grindstone, focusing on how to enrich this nation’s classrooms with excellent STEM teachers. But by the very nature of 100Kin10’s design as a network, we have our fingers on the pulse of teaching, STEM, and their intersection. Our own work has always been informed by an ongoing analysis of local, regional, and national trends and opportunities, but we’ve never before shared them publicly. Without further ado, below are ten insights drawn from dozens of collaboration grants, hundreds of phone calls, thousands of survey responses, half a dozen workshops, twenty in-person organized gatherings, an in-depth media analysis, and other ongoing touchpoints with the nearly-300 diverse organizations that make up 100Kin10. Observing the successes, priorities, and struggles of our expansive partnership, we identified FOUR primary trends. One thing hasn’t changed. Professional development (PD) for teachers remains at the center of the conversation. Students can’t learn what teachers don’t know, and as the STEM world evolves, so must its teachers. Based upon our observations of partner work, partners believe that three things matter: 1) PD needs to be sustained over time, 2) Practitioners need to look outside of schools and to STEM experts in places like museums to offer teachers fresh and current insights into STEM, and 3) Great PD must be accompanied by high-quality instructional materials that teachers can use in their actual classrooms. Leading the way are partners like Battelle Education, DC Public Schools, University of Houston-Clear Lake and others who took advantage of the 2016 Fellowship to prototype professional development programs for early childhood educators that are sustained over time. We also noted an interesting incongruity: while partners admit that in-person PD works best, they continue to search for the virtual silver bullet in digital or online tools. Whether spurred by what partners believe funders want, or a desire to scale impact beyond what is possible through direct contact, the quest for the virtual or online PD panacea continues—without much evidence of its promise. There is no silver bullet in PD, except the need to continue it. Like Dorothy in the Wizard of Oz, partners have come to realize that support for new STEM teachers is in their own schoolyard—in the shape of seasoned and qualified educators. 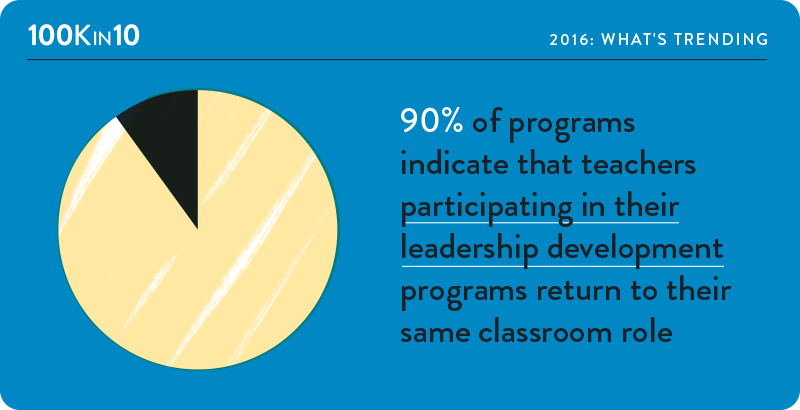 Yet, while there are programs to foster teacher leaders, our annual all-partner survey revealed that master teachers almost always return to their same classroom role and the same ratio of impact that they had prior to their leadership experience. On a practical level, nothing is changing for those master teachers – and that very fact needs to change. With that in mind, sixteen regional 100Kin10 partners gathered in Arizona in September to share best practices and strategies for “Building Effective Mentoring Communities.” Colorado partners, like Denver Teacher Residency and TEAM-UP, a partnership between the Colorado School of Mines and the University of Northern Colorado, are helping mentor teachers become ambassadors to encourage college students with technical majors to consider teaching as a profession. There is still work to be done, but the pendulum is moving in the right direction, as schools attempt to give master teachers increased positions of leadership and influence. Fixing STEM education requires people coming together across sector: schools, museums, corporations, funders, families and beyond. The inherited wisdom was that schools provided content and out-of-school provided inspiration. We’re seeing an emerging trend where schools recognize that they need more inspiration alongside their content, as out-of-school leaders step up to better support teachers, knowing that most kids will still experience STEM only or primarily in their P-12 classrooms. If the spark from these science-rich institutions could be infused into schools, many more children will get that “aha”moment. Our partners’ work to bridge in-classroom and out-of-classroom learning is beginning to deliver more dynamic learning experiences in classrooms, providing teachers with more levers to deliver compelling and comprehensive instruction, and better leveraging the incredible assets and talents of science-rich partner organizations. For a long time, school reformers believed that if they simply put great teachers in front of classrooms, students had all they needed to learn. Instead, it turns out even superhero teachers are more effective when they have high-quality instructional materials such as strong lessons plans, assignments, or equipment. Driven by this awareness, partners are working to put much-needed instructional material into teachers’ hands. 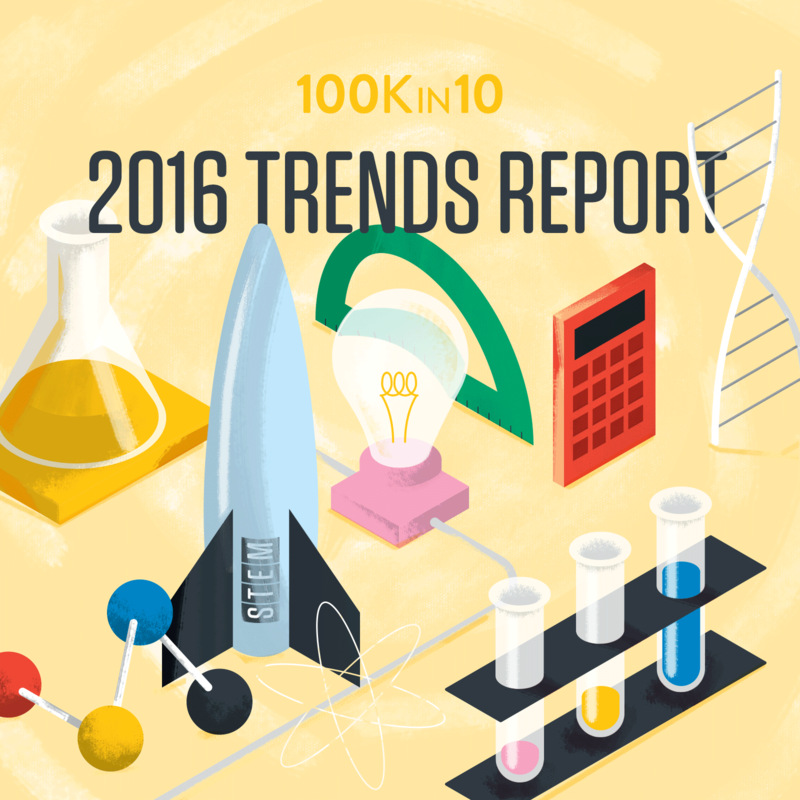 In 2016, 100Kin10 evaluated the STEM landscape, looking for unique opportunities that lent themselves to network solutions, and to our “sweet spot”: early-stage ideas where initial investment could yield significant dividends. We chose to incentivize problem-solving in THREE areas: active STEM learning in early grades; improving and increasing engineering and computer science learning; and prioritizing STEM in the implementation of the Every Student Succeeds Act (ESSA) and continued roll out of Common Core (CC) Math and Next Generation Science Standards (NGSS). Active STEM learning has been on our partners’ radar (and is shown to improve student performance in STEM), and in 2015 we noticed a clear uptick in partners focusing on early childhood within STEM. Yet funding isn’t nearly sufficient to support this promising opportunity. 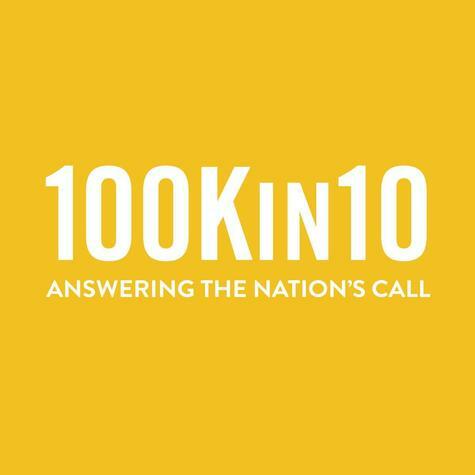 So, 100Kin10 made three overlapping investments: we invested upwards of $2M in the 2016 Fellowship, focused on active STEM learning in early childhood; we created an Active Learning Online resource hub in conjunction with the White House Office of Science and Technology Policy’s Active Learning Day; and we partnered with IDEO’s Teachers Guild to guide teachers to develop innovative solutions to the active STEM teaching and learning challenge. From building blocks to catching (and eating) bugs, little kids begin their lives trying to figure out how things work, just like engineers. But this instinct needs to be nurtured if today’s students can grow into tomorrow’s tinkerers, builders, and inventors. Yet despite driving the 21st century economy, most teachers aren’t trained in these subjects and as a result, they are barely taught in schools. This year, 100Kin10 introduced its first ever Networked Improvement Community (NIC) where 2015 Fellowship participants—who received a total of more than $3M in funding to implement ideas to increase the reach and quality of engineering instruction in K12—were joined by other partners to study the root causes of this challenge, design experiments to improve their efforts, and test the efficacy of those efforts, en route to chipping away at the larger problem. From teacher certification to standards and assessments, state and federal policies have long been a source of frustration and confusion for schools, teachers, and parents. The passing of the Every Student Succeeds Act in December 2015 established a new world order in how education is governed, raising a host of new questions and misunderstandings across a range of stakeholders. In response to this, we ran our third annual 100Kin10 Solution Lab in 2016 to workshop the shared challenge of strategically encouraging and supporting states to prioritize STEM in state-level implementation plan. Alongside policy specialists, advocacy gurus, campaign experts, and social movement leaders, 30 diverse partners identified tools and resources to overcome this challenge. As a result, partners co-invested $80,000 to support the development of “Every Student Succeeds with STEM”, a comprehensive and hands-on strategy complete with a communications hub to support the work. Our college- and career-ready standards toolkit – Plagiarize This – proved to be a critical tool in building the messaging strategy for this work. Looking forward to 2017, we have a few hunches. Call them around-the-corner “things to watch for” or emerging trends, our crystal ball tells us that these challenges are so important that they deserve extra attention. Here are our three bets for the next year. To help us identify the Grand Challenges to getting and keeping 100,000 excellent STEM teachers, we surveyed thousands of teachers. One item showed up again and again, something that we hadn’t heard from principals or sector leaders: teachers (and their students) need to be able to experiment in their classrooms. In 2017, in 100Kin10’s third Fellowship, 26 individual representatives from nine partner organizations will come together to tackle this critical issue: STEM educators need flexibility and “permission to fail” in their instruction in service of deeper STEM learning. These partners will come together as a collaborative community to design, prototype, test and iterate solutions that prepare and empower teachers to experiment with their instruction in ways that facilitate more active STEM learning in their classrooms. 2) The Many Faces of STEM: Beyond and Between S.T.E.M. While traditional efforts address the STEM disciplines separately, there are those who advocate for a more connected approach allowing schools to teach STEM subjects in a more integrated way. In the context of real-world issues, the goal is to make these fields more relevant and compelling to students. A few years ago, this subject was explored in a study done by 100Kin10 partners, the National Academy of Engineering and NRC Board on Science Education. However, whether students will benefit by connecting and expanding currently divided subject areas remains an issue prime for deeper exploration. Our partners are also thinking about disciplines that are typically overlooked in the STEM conversation, subjects like medicine, statistics, computational thinking, physics, astronomy, Earth science and STEAM (with the added A for arts). The American Association of Physics Teachers, , American Modeling Teachers Association,, and UC Berkeley (Lawrence Berkeley National Lab ) came together to learn more about each other’s work and develop a plan to support teachers in physics, astronomy, and Earth science via computational thinking. Inequities persist in education, and even more acutely in the STEM subjects. We need everyone to have a STEM education, whether they come from Westchester, NY, the South Side of Chicago, or Enid, OK; whether they are recent arrivals or 4th generation Americans. With universal issues like global warming, epidemics, cancer, aging and water shortages, America needs more engineers, programmers, and skilled STEM professionals from all backgrounds and with all perspectives to provide innovative solutions. In 2017, 100Kin10 expects to see work in this area. How much STEM capacity can we unleash? Partners like DonorsChoose.org have been traversing the nation meeting with partners like Boise State University, the Indiana Department of Education and Hillsobourgh County Public Schools to discuss strategies to help bring chemistry sets and STEM resources to young minds in small towns across America. Plus, Teach For America (TFA) is working with the National Alliance for Partnerships in Equity to explore PD curricula for equity in STEM in TFA programs.